Deborah Carlson, President of the Institute of Nautical Archaeology (INA) (Ph.D., University of Texas at Austin), is an archaeologist specializing in trade and seafaring in the ancient world. She has assisted in the direction of both terrestrial and underwater excavations in Greece, Turkey, and Italy, and has been part of the AIA’s National Lecture Program since 2005. Dr. Carlson has just completed the excavation of a 1st-century B.C. marble carrier wrecked at Kizilburun, Turkey, and is overseeing the publication of a 5th-century B.C. Classical Greek shipwreck excavated at nearby Tektaş Burnu. She has also received funding from the National Endowment for the Humanities to pursue the excavation of a 1st-century B.C. shipwreck off the southern coast of Sri Lanka, currently the oldest shipwreck in the Indian Ocean. 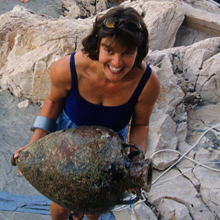 Dr. Carlson is an Associate Professor in the Nautical Archaeology Program (Department of Anthropology) at Texas A&M University, where she teaches courses in Greek and Roman archaeology, classical seafaring, and Mediterranean pottery. Dr. Carlson was the 2003-04 recipient of the AIA’s Olivia James Traveling Fellowship, and has published in both the AIA’s Archaeology magazine and American Journal of Archaeology. She has lectured to excellent reviews on two AIA-sponsored voyages in Greece and Turkey since 2006, and is especially looking forward to sharing on this 2012 voyage her experiences in helping to establish one of the many shipwreck exhibits in the Bodrum Museum of Underwater Archaeology. During our voyage she will discuss, among other topics, the past achievements and future challenges of the field of underwater archaeology, the size and diversity of ancient commercial cargoes, and the challenge of shipping monumental stones from quarry to construction site.